If you use Windows 7 you might have noticed that there is no shutdown confirmation dialog box like Windows XP. Well, this reduces wastage of time and you can quickly shutdown your computer but the problem is that if you accidently click on the shutdown button then you can’t cancel it. But, don’t you worry there’s a solution for your problem. 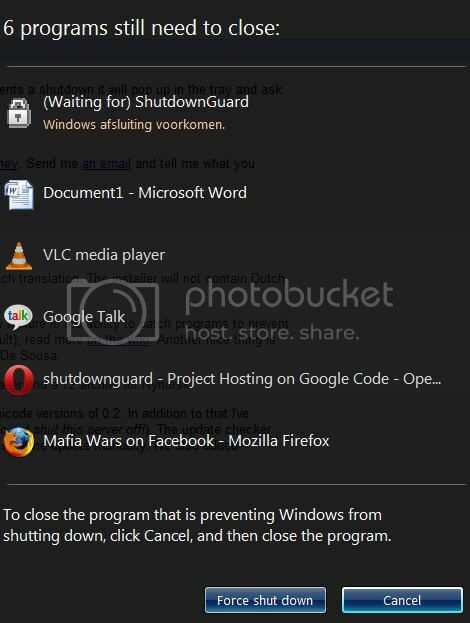 Using Shutdown Guard you can get a shutdown confirmation in Windows 7 which looks like above. When you click on the force shutdown button then only Windows 7 will shutdown. ShutdownGuard is an easy to use freeware. Download it from the below link and extract its contents to a separate folder and then launch the .exe. You should see a lock icon on the right hand bottom side of the screen. If you click on it the lock will open. Now, if you try to shutdown you won’t get the confirmation window. Make sure that the icon is in lock state in order to get a shutdown confirmation window.